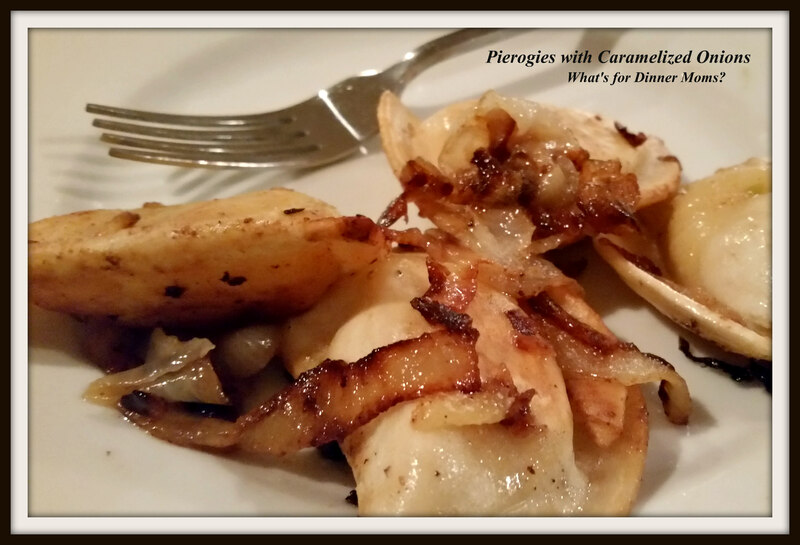 Pierogies with Caramelized Onions or What to Make on a Night You Don’t Really Want to Make Dinner – What's for Dinner Moms? This is one of our got to have it in 30 minute meals and it doesn’t take a whole lot of fussing but tastes amazing! Frozen pierogies, butter, and an onion or two is all it takes. 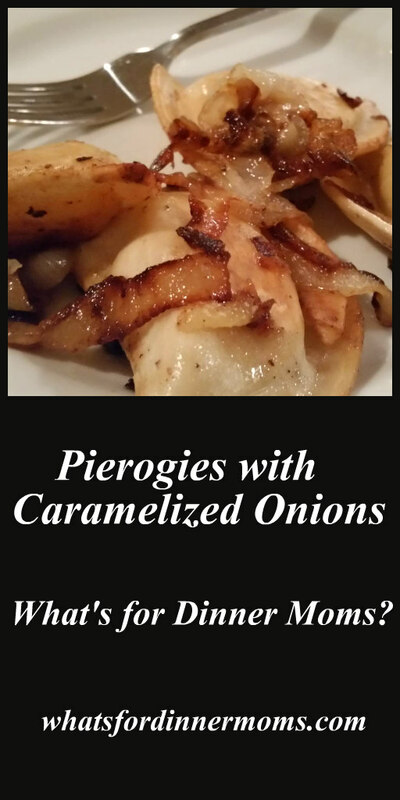 You can make fresh pierogies and I am sure it is amazing but this is one of those I don’t have time, I don’t want to cook, and I just don’t want to Mom meals. Honestly the hardest part is slicing the onions and if you have a food processor even that isn’t really difficult! This is one of my favorite I don’t know what I want but I want something easy and savory meals. I make this with the four cheese pierogies because those are my favorite but choose your favorite to put in here. I think it is the onions that really make the dish. I also like that the pierogies get a bit crisp and browned. Towards the end of making the dish you will need to stir it more frequently and watch the cooking process but in the beginning you can let the onions cook for 5 minutes or so in between stirrings. Enough time to make sandwiches for tomorrows lunches or get the items ready for tomorrow’s dinner (or have the kids do it!). I serve this with a green salad and/or a green vegetable (canned or frozen beans work great with this as does frozen broccoli). In a large skillet over medium heat melt 2 tablespoons butter. Turn heat to medium-low and add onions to pan. Cook onions on low stirring every once in a while. Once onions start to wilt and turn brown, about 15 – 20 minutes, you will add the pierogies and additional butter. Stir so that the pierogies are well coated with butter and don’t stick. You will need to stir it more frequently to keep the onions from burning and the pierogies from sticking. If needed add a bit more butter to the pan. Once pierogies are heated through remove from heat and serve. This looks so yummy! Yes we all have those days more sometimes and less other times! Thanks for being real! Thanks for understanding! Some days are just like that – paper plates and all! yes I agree, that is life for sure! I agree… sometimes it is not only the joy of cooking but the missing inspiration or creativity. This is a great recipe idea! I love to spend a day making homemade pierogis, including the pasta circles, and freezing them in portions. I haven’t done that in a long time (years) but looking at your meal makes me crave them. I must get to freezing, soon! Then I’ll have some lazy day meals to fall back on too! Looks good! My grandson is part Polish, I bought and made these for him recently. The addition of cooked sliced onions sounds fabulous, thanks! Pierogies and caramelized onions a great dinner.